This rich and creamy corn chowder recipe is filled with sweet fresh corn and tender bite-size yellow cubed potatoes. This particular version is a twist on a classic because it has lots of Mexican flavors. Is it soup season yet? 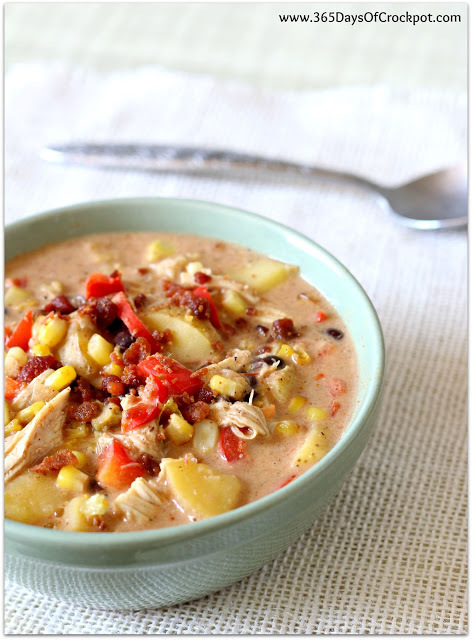 This crockpot Mexican corn chowder uses fresh ears of corn on the cob so it’s the perfect balance of summer flavor with the cooler chilly fall weather (and don’t worry if it’s not corn on the cob season where you are you can always use frozen corn). We had several ears of fresh corn on the cob in our fridge so I decided to make a corn chowder. I wanted to mix things up a bit so I made the chowder with a Mexican flare. I used black beans, diced green chiles and some spicy taco seasoning to flavor the soup. To make it creamy and delicious I added some cream cheese (you can never go wrong with cream cheese). You’re going to like this recipe! My whole family was stoked when I served them this for dinner. It does make a lot you if you have a smaller family you could easily halve this recipe. 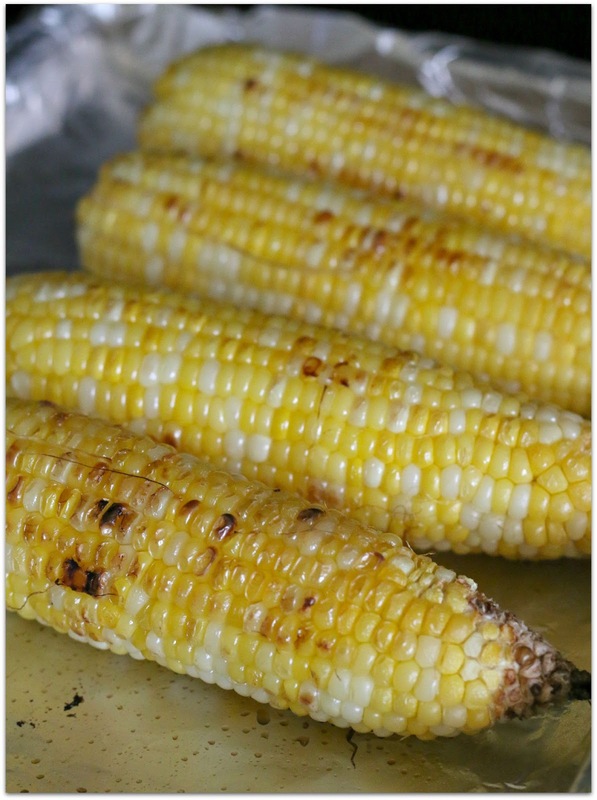 You can grill your corn or cook it in your oven. I like to use a foil-lined cookie sheet for easy clean up. I also made it easy by spraying each ear of corn with cooking spray, instead of taking the time to butter each ear. 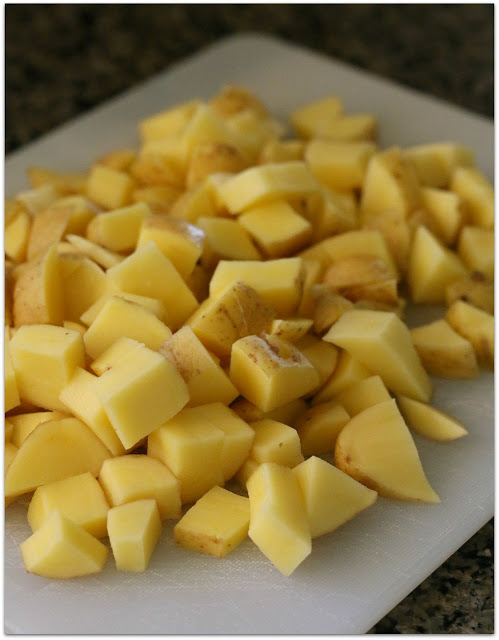 While the corn is cooking, dice up yellow or red potatoes into fairly small cubes. I always keep the peels on because it’s healthier and it’s easier. When the corn starts to look like this it’s ready to go! 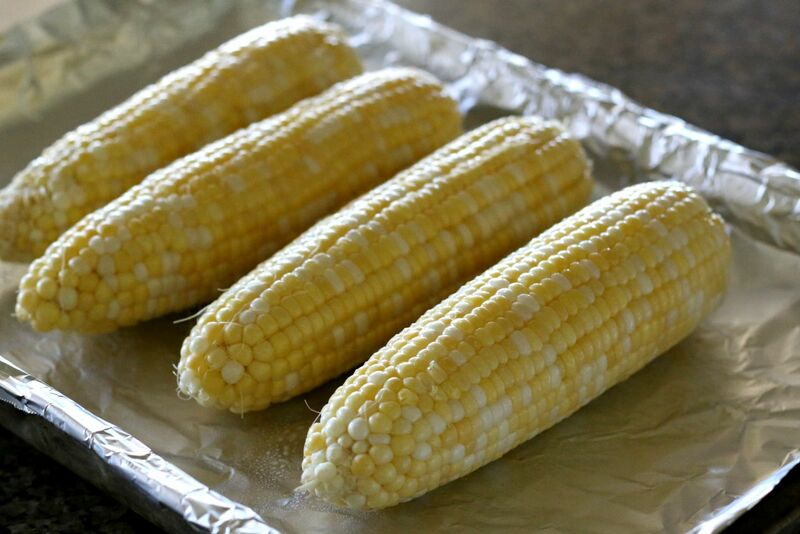 It’ll be hot, so be careful while you cut the kernels off of the cob. 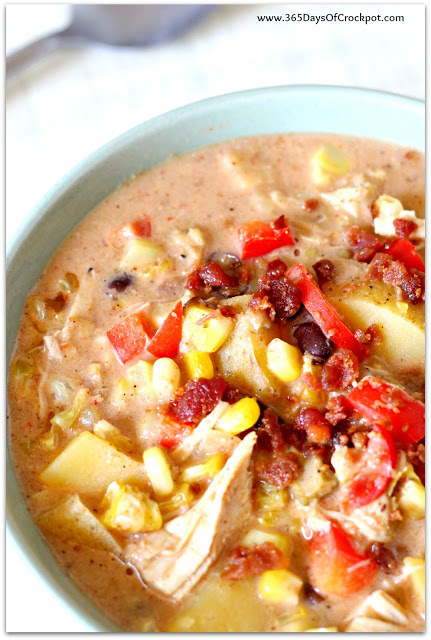 Serve this fresh corn chowder up for dinner this week! Ridiculously delicious. This is now my husband’s instant pot soup. Thanks again Karen! Thanks Joanne! Glad he likes it. Ip beef stew recipe,can u give me ur best? Love it!!! I have leftovers of it in the fridge that I keep on heating up! Can’t get enough of it!!! Yum yum!! I also plan on giving some of it to a friend that is hospitalized and sick of hospital food! Oh Jackie, this is so nice to hear. I’m sure your friend will really appreciate it! Can this be done in the instant pot? How long would you recommend? Yes I bet you could do it in the Instant Pot. I would only cook for 5 minutes. The pot will take a while to come to pressure because it will be very full. Then do a 10 minute natural pressure release. I have made this many times and love it. My recipe has changed, I use smoked chicken thighs and stock made from the smoked bones. I use 3/4 cup salsa Verde instead of canned chili’s and salsa. Everything else is like your recipe. Most excellent. Delicious! My kids loved it. We topped it with avocado (and the kids put salsa and sour cream on top too). Definitely a keeper! Is this a gluten free recipe? It’s delicious! I want to make it for my friend who is gluten intolerant and it looks like it would be good. Just want to be sure. I think it’s gluten free! Just check packaging to be sure. Followed recipe to the letter but thought I needed a bit more liquid. I had used all of my chicken broth so I added a can of creamed corn and it turned out great! Thanks! Hi!! This recipe looks great. Just curious what size did you crock pot did you use? Thanks! What kind of potatoes did you use? My yellow potatoes cook in 4 hours on low. I'm sorry it didn't work out for you. Every slow cooker is different and so I just always tell people to get to know their slow cooker. Red potatoes also cook in 4 hours or 4.5 hours on low. Make sure they are cut up in small cubes. oh yes, MaggieMae, I love red potatoes. Good tip, thank you very much! 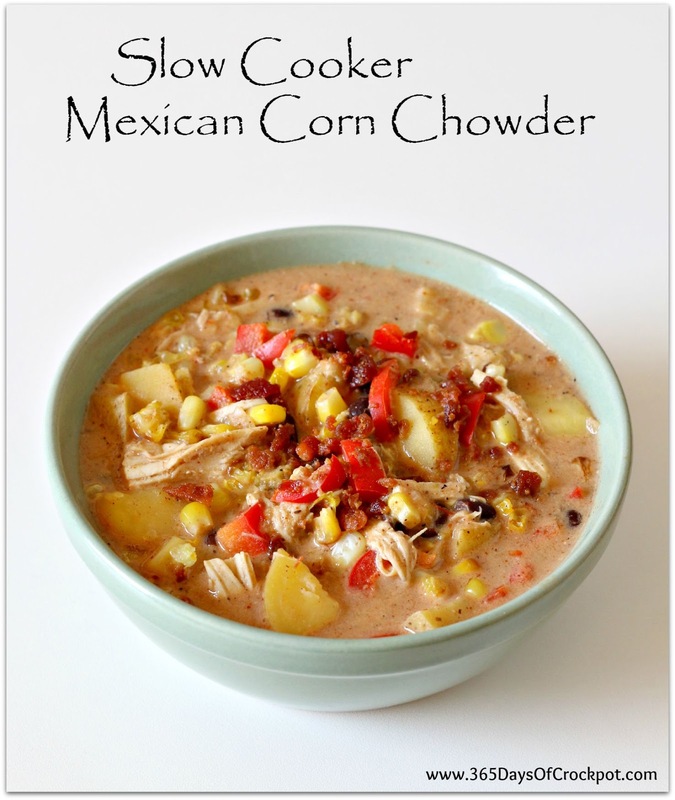 Just made this as my first meal cooked in a slow cooker – it was very good. Another time I might use hotter chillies as we are fans of hot spices in this house. I served it with fresh from the oven cornbread. This looks so yummy! The perfect comfort food for fall :). 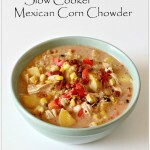 this is a great version of a meatless corn chowder I made last week in my slow cooker. The corn chowder I made last week was um-mm. This is double um-mm. Thank you, it's so simple in the slow cooker and it's delish. This sounds like perfection in my mouth right now! My only question is, what is the purpose of the cornmeal and can it be eliminated? If yes, then I have everything at home right now to make this and I can throw it in at lunchtime. Thank you!!! Great post! Great post; love all the photos. And this recipe sounds great.